It’s charming to be cooped up by a rare Seattle snowfall. For about three hours. Snowball fight, check. Snowman, check. Snowy tromp through the neighborhood, check. Hot chocolate. Um, is the snow starting to melt yet? Apparently not. Apparently there is more coming. It’s gorgeous, of course, and I’m sure we’ll have more fun family adventures in the snow tomorrow–but for tonight we channeled summer, drank beer with friends, and ate fish tacos. This Fish Taco Spread isn’t the kind of authentic that will transport you to a San Diego beach, but it hits the spot in mid-winter in Seattle. First, start your quick-pickled onions and hot peppers: combine a small, thinly-sliced red onion with strips of jalapeno in a non-reactive pot and add 1 c. seasoned rice vinegar, the juice of half a lime, and a tsp. of salt. Bring to a bare simmer and stir for a minute, then remove from the heat and cool to room temperature. Make a lime crema by combining equal parts sour cream and mayonnaise with a big pinch of salt; zest in a lime and then thin the mixture with lime juice to taste. Prepare your fish (we used a couple of cod fillets) by making a rub of 1 tsp. oregano, 2 tsp. cumin, 1 Tbsp. chili powder, 1/2 tsp. salt, 1/2 tsp. black pepper, and a Tbsp. or more of brown sugar. Rub the fish with oil and then pat the spice mixture all over it. Bake at 400 until the fish flakes (this will depend on the thickness of your fish); turn on the broiler for a minute or two at the end to caramelize the spice mix if it isn’t already bubbling. Heat plenty of corn tortillas (you can toss them in the oven with the fish for a few minutes) and serve them wrapped in a towel with the fish, pickled onions, crema, grated cheese, shredded cabbage, cilantro, and a good salsa or two. Everyone grabs a couple tortillas, breaks off chunks of fish, and adorns their own plate of fish tacos. 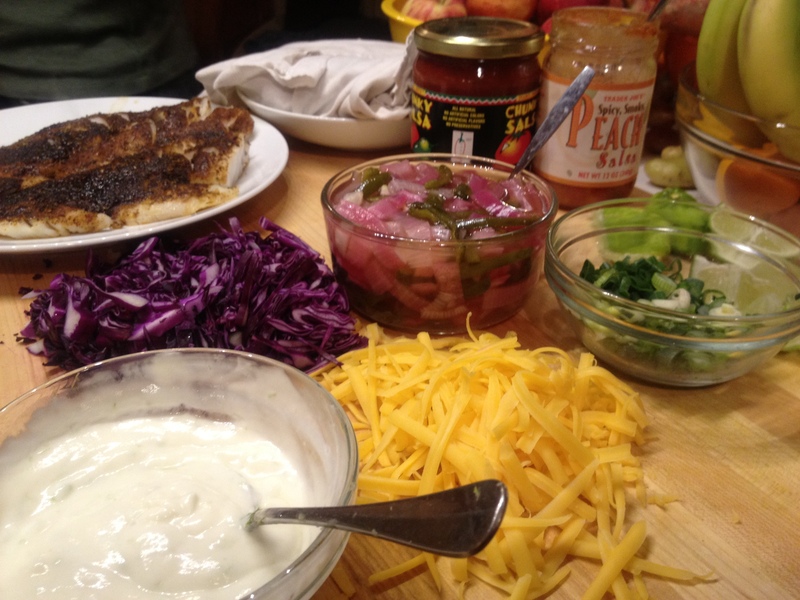 This entry was posted in Easily Multiplies to Feed a Crowd, Fish, Mexican Flavors and tagged cooking, dinner, food, lifestyle, recipes on January 16, 2012 by emmycooks. My husband will be very pleased… he loves fish tacos but I’ve only tried making them once, and they turned out just okay. These sound wonderful! Thanks! Nice! I always like making food that my loved ones especially enjoy. And my husband loves fish tacos too, so this is a regular dinner at our house (though we usually make them with grilled halibut in the summer)!